Has London only created a more favorable platform for both Assange and Latin American adversaries of the United Kingdom by threatening in effect to disregard the diplomatic status of Ecuador’s embassy? Claiming the obligation to deliver Julian Assange to Sweden ignores both the higher regard accorded to diplomatic law and the facts of this case, (where Assange is sought formally for questioning and not prosecution and there is some concern that the extradition process is being itself abused). Diplomatic law has both a higher and more broadly endorsed set of standards than extradition law. Extradition law lacks global uniformity - a patchwork of outdated procedures that fundamentally favors states over individual rights. It is not a trial were defendants have opportunity to present defenses or frequently even witnesses. (The extraditing state takes the view that all such fundamental rights can be exercised once the person – there is no status as defendant yet – once he/she is delivered to the requesting state). The process can and has been abused to bypass human rights and the rule of law that otherwise might be available to those actually designated as charged/indicted and defendants. (See Professor M. Cherif Bassiouni’s “International Extradition: US Law & Practice”). By contrast, diplomatic law is more standardized and increasingly governed by multilateral rather than mere bilateral treaty arrangements. Vienna Convention on Diplomatic Relations and the UN Convention on the Prevention and Punishment of Crimes against Internationally Protected Persons, Including Diplomatic Agents (adopted in 1973) augment well established international customary law that has existed for centuries/millennium. Any violation of such diplomatic standards would be seen in context of offense against the treaty/signatories, (while most extradition treaties are only bilateral). There may be highly unusual exceptions that are generally defined by urgency, such as the shooting of a UK policewoman in 1984 from Libya’s (Gaddafi) embassy in London. It is also a broad overstatement to claim that the UK is obliged to deliver Julian Assange to Sweden. It is a political act subject to some degree of judicial review. Whether such is a mere veneer depends on numerous circumstances, but the authority and any conditions imposed by a domestic court have been in the past ignored by the courts of where such subjects have been extradited. In the past, despite promises that its prosecutors would not seek the death penalty for extradited suspects, US based prosecutors have in fact sought execution. Other such “commitments” are perhaps not routinely but regularly ignored. Although I would not have opted for Mr. Assange’s tactic of seeking asylum, he is correct in not trusting the durability of any commitments made by Swedish or US officials on basis of precedent and inability of UK or UN or Australia officials/courts to enforce such once Mr. Assange leaves their jurisdiction. The greatest implication of the apparent UK threat to ignore the diplomatic status of Ecuador’s Embassy may be significantly more serious than originally perceived in the overbearing light of the Assange and Wikileaks controversy. Ecuador has sought to rally the Organization of American States (which includes the US and is based in Washington) for its cause. 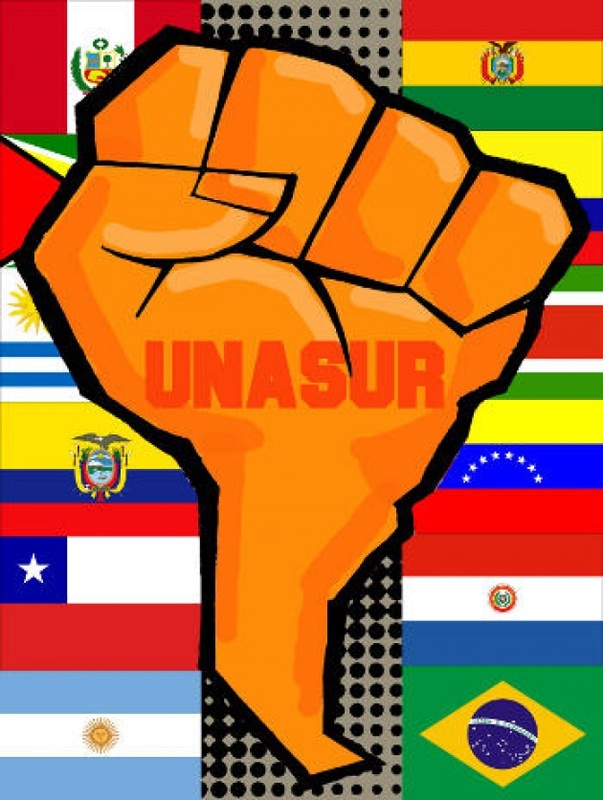 It has also called for a special meeting of the South American regional grouping UNASUR (Union of South American Nations). ---The UK’s implicit threat to ignore/violate Ecuador’s London Embassy not only reminds once again but places the Falklands dispute in less favorable context. ---While the leftist authoritarian leaning regimes of South America, from Chavez’s Venezuela to Ecuador have faced their own accusations of suppressing media freedom, the Assange case gives them an opportunity to project themselves as defenders of human rights. ---Ecuador has managed to promptly exploit the perceived UK diplomatic threat and gain public support from many of its South American neighbors against both London and Washington. ---The veiled threat by London may expose British diplomats to greater risk from Latin America to the Middle East as the same rationale employed by the UD is turned against its diplomatic outposts. (Recall the occupation of the US embassy in Tehran over 3 decades earlier). Platform or "Circus" not Likely to Leave Town Soon! South American diplomats have gathered in Guayaquil, Ecuador to both adopt a statement critical of the perceived British threat and give symbolic backing to Ecuador’s Government. 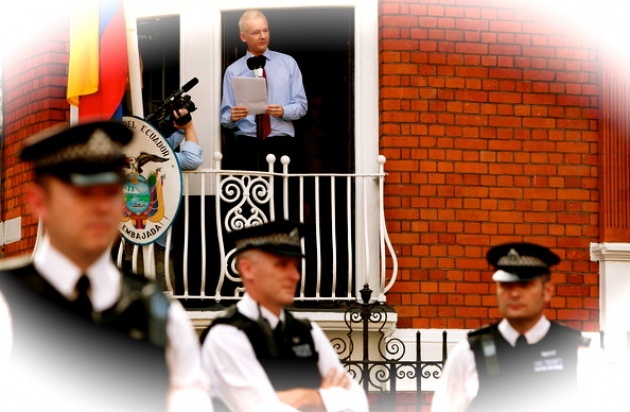 As evidenced by Assange’s appearance and speech today from the balcony of the Ecuadoran Embassy in London, rather than back-off, the UK has one seems unwittingly managed to raise the profile of the dispute but also Assange’s claims of persecution and a “witch-hunt” against him, Bradley Manning “UN Investigator Denied Unmonitored Visit to Wikileaks Prisoner & US” and WikiLeaks overall. Also See our Previous Article: “Julian Assange & CIA Secret Prison in Romania".